Size: 6.5 NOTE: See the description for sizing info. 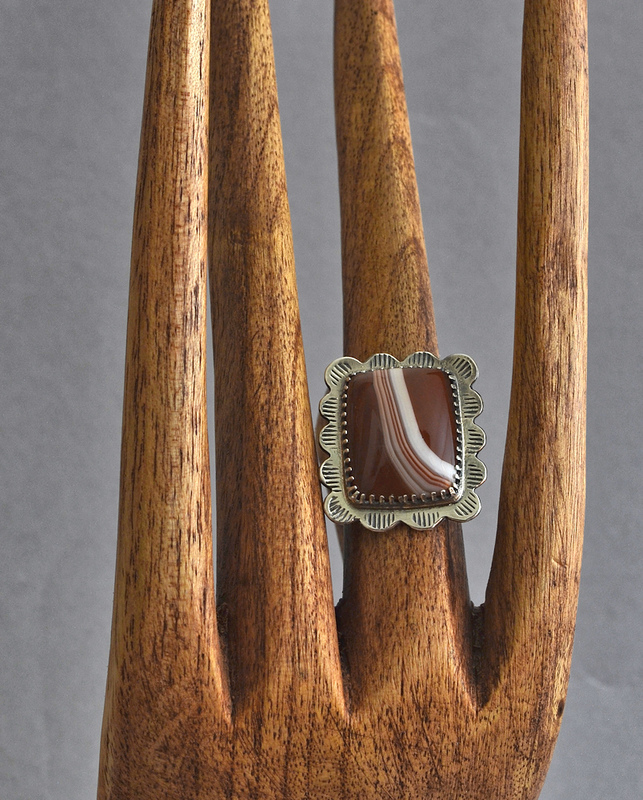 Here is an unusual, striking and sophisticated ring. The classic Lake Superior Agate boasts a well-defined pale swirl of white fortification lines within a beautiful rufous background. 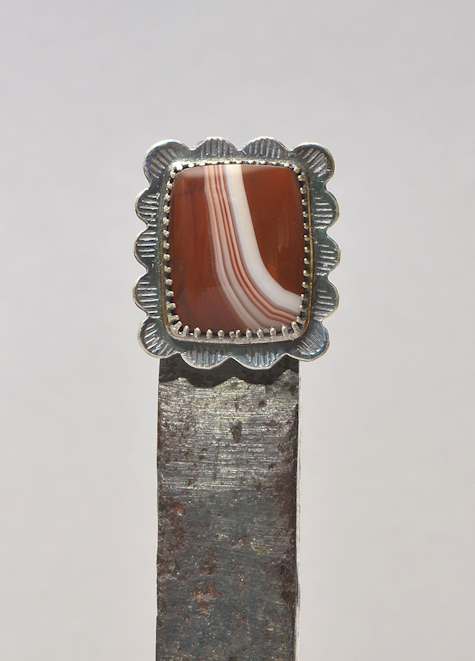 The setting reflects the waves on Lake Superior where this agate is found. 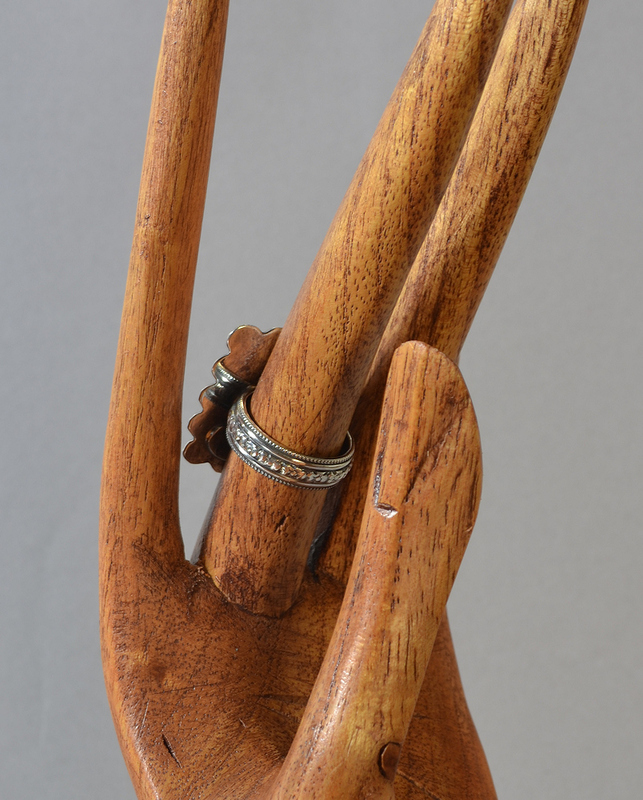 The ring will blend nicely with natural fabrics, perk up a winter white ensemble, and play well with other rings to make a fabulous stack. In searching for a color name for the iron-tinged stone, it seemed "rufous" was reasonable. Of course, like Werner's Nomenclature (below), I think first of animal colors as possible descriptors. It's not surprising that many animals exhibit earthy rufous colors sometimes brightened by small areas of white, e.g., the Rufous Hummingbird, Rufous-sided Towhee (now called "Spotted"), the rufous-eyed brook frog (Duellmanohyla rufioculis); the vulnerable Rufous Mouse Lemur (Microcebus rufus), etc.. We could easily wind up talking about any one of these fascinating creatures! But instead, let's review the subject of the famous Lake Superior Agates or "Lakers," shall we? While one usually thinks of searching the shores of Lake Superior for these agates, they are quite widely distributed. One of the books listed below, The Storied Agate, mentions walking farm fields in the upper Midwest during the spring searching for "winter potatoes," i.e., rocks which sometimes turn out to be these gorgeous Agates. In his first book, Agates, Zenz offers a long essay on these stones in which he mentions they are "by far" the oldest Agates on earth, estimated to be between 1.1 and 1.2 million years old. In his other two books (below) he has many photos of these Agates along with his profiles of various famous rockhounds including a man who scuba dives for the stones in Lake Superior. Then we come to the Exquisite Agates book which says they are 1100 million (1.1 billion) years old... so did Zenz write "million" instead of "billion?" lakesuperior.com says, "Some of the rocks around Lake Superior date back to the earlier Archean Eon (4000 - 2500 million years ago), a time when the oldest rocks were formed on Earth." Minnesota DNR (https://www.dnr.state.mn.us/education/geology/digging/agate.html) says, "[Lake Superior Agate] was formed during lava eruptions that occurred in our state about a billion years ago." Perhaps the discrepancies relate to different definitions of "formation." The early lava flows initiated the formation, but lava isn't Agate, there are lots of steps in between. This is going to take a good Agate geology textbook to figure out, if you come to a definitive answer, please let me know. Have I bored you with that diversion? Agate formation is a much debated subject, we probably don't want to discuss it here, but somehow I assumed a rough date for their formation would be easy to determine. Clearly not. So, sorry I went down that rabbit hole! Let's get back to this little ring! PLEASE NOTE: At present it is a size 6.5. I can open the back of the band to make it adjustable and size it for you. The band is heavy, I don't recommend you try to size it yourself unless you have forming tools. I do think you will like it, and there won't ever be another like it (since "God never does the same thing twice," as my teacher used to say). If it speaks to you, please order it today!